(CNN) -- Ferrari will learn on Wednesday whether they have been successful in obtaining an injunction against the FIA and their decision to introduce a budget cap into Formula One next season. 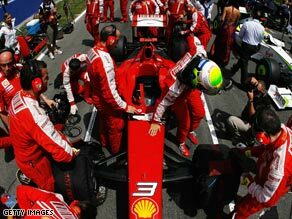 Ferrari have been warned to expect an appeal if they obtain an injunction against governing body the FIA. Motor sport's world governing body recently imposed a $60 million figure, but there has been widespread opposition from the teams driven by fears it would make the sport a two-tier championship. That prompted Ferrari to seek an injunction that was heard for an hour at the Tribunal de Grande Justice in Paris on Tuesday. FIA president Max Mosley has already said his organisation will appeal if the verdict goes against them. At the moment teams such as Ferrari and McClaren operate on annual budgets of $200 million to $300 million. Teams might decide not to stick with the budget cap, but those that do will get technical freedom. Mosley and F1 chief Bernie Ecclestone attended a gathering with team bosses at a Heathrow hotel in London on Friday to discuss the crisis. "During the meeting it became apparent that Ferrari have made an application to the French courts to apply for an injunction to stop us doing what we want to do," Mosley told waiting media after that meeting. "At the end of the meeting no solution was agreed, with teams leaving to discuss alternatives. It was a friendly meeting but the teams have gone off to see if they can come up with something better than the cost cap."